Ideal damp mopping solution for all surfaces. Economical maintenance for polished floors - will not remove or dull polish at recommended dilution. Perfect for spray cleaning. Removes dirt and heel marks with ease. For regular cleaning and maintenance of linoleum, P.V.C., rubber, sealed cork, sealed wood and thermoplastic floors. For general mopping dilute Pine Gel 1:100. Mop, allow to dry, burnish if required to improve shine. For spray burnishing dilute Pine Gel 1:50. Spray lightly ahead of machine fitted with a nylon pad and immediately polish to a shine. N.B. 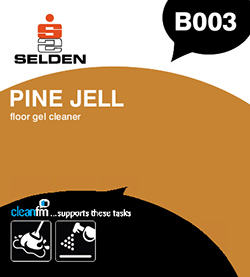 For maximum floor life we would recommend the application of Seldur or Diamond Brite prior to regular maintenance with Pine Jell.